Embedded fire detection and risk of fire software are highly accurate algorithms that can be embedded in the Sii and Accuracii cameras. Adding these algorithms turns the cameras into versatile systems that ﻿﻿can ﻿﻿provide both safety and security of equipment and personnel. Using thermal imaging, the fire analytic algorithms can detect an active fire with the Active Fire Detection Algorithm as well as detect when a fire is about to occur with the High Risk of Fire Detection Algorithm so that fires can be prevented and contained with minimal or no damage to facilities. Vumii’s Sii AT is a 24/7 outdoor security thermal camera used for observing and monitoring sensitive sites. The camera provides crisp, clear thermal image in total darkness, light fog or smoke. Vumii’s Sii ML is a 24/7 outdoor security thermal camera used for observing and monitoring sensitive sites. The camera provides crisp, clear thermal image in total darkness, light fog or smoke. Vumii Accuracii ML is a powerful day-and-night, multi-sensor observation system especially developed for security applications. It allows mid-range detection and observation using state-of-the-art 17µ 640 x 480 thermal camera technology. 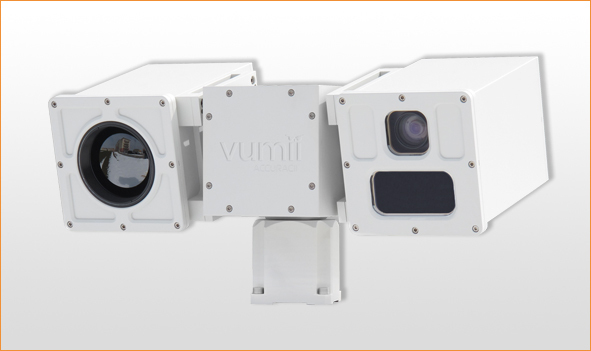 Vumii’s Accuracii ML features either a 15-100mm Continuous Zoom head or a 45/135mm dual field of view head for day and night operation and a 1/4” CCD camera for daytime operation. Vumii Accuracii ML is ideal for both the detection and assessment of security threats. Vumii Accuracii ML is ruggedized to withstand the harshest weather and environmental conditions, including rain, direct sunlight, high humidity and dust.